Do you love kayaking? 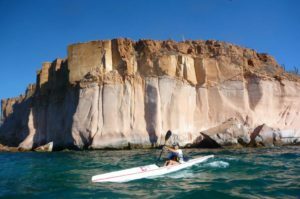 Kayak in Baja is the perfect place for this sport. Finding the perfect place to kayak depends on the time you have, your kayaking knowledge and the type of adventure you are looking for. Because the Sea of Cortez is a gulf, slow currents and still waters make it an ideal place for this hobby (or spor). This swath of water also has the most varieties of different species of fauna in the world. 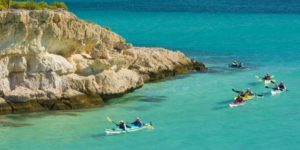 This makes the experience even more enjoyable as you can witness different beautiful sea animals while kayaking, not to mention the beautiful Mediterranean like desertic views along the coast. This excursion allows the exploration of spectacular pristine, unspoiled beaches and small islets, like Gallo y Gallina, where sea lions inhabit. Here you can snorkel around huge rock cliffs. This journey stretches from La Paz to Loreto aboard the “Pez sapo” boat. Throughout this trip you will visit Espiritu Santo, San Jose, San Francisco and Santa Catalina islands, it is possible to kayak around each one of this islands, exploring caves and coastal cliffs, always accompanied by a tour guide and a support boat. An interesting trip departing from Loreto. Once here you can kayak all along the coast, visiting the remains of ancient historic missions. 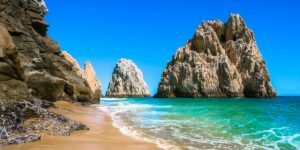 If near Cabo San Lucas, you just need to rent a kayak to playa del amor, which is right next to the famous Cabo rock arch, we’re sure you will enjoy it plenty. Located in the tourist corridor San Jose del Cabo-Cabo San Lucas. This beach is a must! A blue flag beach with clear blue water. If traveling by car to Baja remember to get your vehicles insured with the best Mexican car insurance in the market! Punta Cabra… dunes, huge long beaches and great surf! Previous story Can foreigners own property in Mexico?